Introducing Strangelove – new family of 3 fonts which includes alternates, swashes and multilingual glyphs. Strangelove – a gorgeous calligraphic font perfect for wedding stationery, lettering on greetings cards and any kind of artwork. File format: .otf, .ttf,.eot for Photoshop or other vector software. 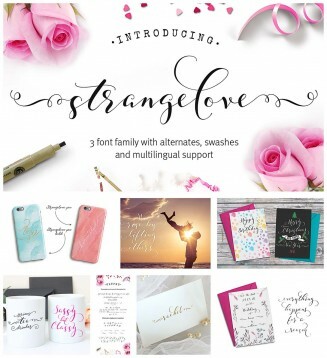 Tags: calligraphy, feminine, font, fun, invitation, script, swirls, watercolor, wedding.